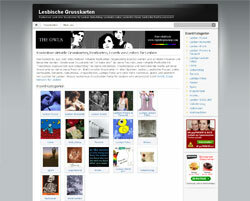 The SHOE International Network consists of several successfull Lesbian Websites. The SHOE Lesbian Network stands for Community, Support, Empowerment and Self-determination. At the same time the SHOE Network connects Lesbians from all around the world, supports national and international Lesbian and Gay NGO's (Non-Governmental Organization) and has won several prestigious awards. Huge Online Community for Lesbians all around the world. With personal Profiles, Videochat, Forums, Classifieds, Shop and more. International Online Shop for Lesbians and Gays.Selling all sorts of Lesbian and Gay Pride items aswell as Jewelry, Books, Movies, Clothing and more. Online Website with over 1000 different.images for Lesbians. Of course you will also find cards for different occassions such as Birthdays, Weddings, Valentines Day, Halloween or Christmas. The very first online Site for Lesbians in Switzerland! It has since been the number one site for news, information about the lesbian scene, classifieds and since 2008 also has an active online community. Lesbian Site for Lesbians living in Austria. Contact us if you are interested in buying any of the above Lesbian Domains!